SUMMARY. Introduction. Few studies have investigated the effects of efficacious psychotherapy on structural alterations of discrete brain regions associated with posttraumatic stress disorder (PTSD). We therefore proposed to evaluate the neurobiological effects of eye movement desensitization and reprocessing (EMDR) on 19 patients with drug-naïve PTSD without comorbidity, matched with 19 untreated healthy controls. Methods. We administered the Clinician Administered PTSD Scale (CAPS) and conducted brain MRI measurements (with Optimized Voxel-Based Morphometry). Patients received 12 EMDR sessions over three months. Then patients and controls were reassessed. Results. At baseline, grey matter volume (GMV) differed significantly between patients and controls (F 1,35 =3.674; p=.008; η2=.298). Analyses of 3-month scans showed no changes for controls, while significant changes were highlighted for patients post-EMDR, with a significant increase in GMV in left parahippocampal gyrus, and a significant decrease in GMV in the left thalamus region. The diagnosis of PTSD was effectively eliminated in 16 of 19 patients, reflected in a significant improvement on the CAPS (t(35)=2.132, p<.004). Discussion and conclusions. Results indicated post-EMDR changes for patients in brain morphology. We discuss whether EMDR’s mechanism of action may work at the level of the thalamus, an area implicated in PTSD pathology. KEY WORDS: PTSD, EMDR, morphovolumetric. RIASSUNTO. Introduzione. Esistono pochi studi che hanno indagato gli effetti di una psicoterapia ritenuta efficace sulle alterazioni strutturali delle regioni cerebrali associate al disturbo da stress post-traumatico (PTSD). Ci siamo, pertanto, proposti di valutare gli effetti neurobiologici della terapia EMDR su un gruppo di 19 pazienti con PTSD, senza cura farmacologica e senza alcuna comorbidità con altri disturbi psichiatrici, a confronto con un gruppo di controllo costituito da 19 soggetti sani non trattati. Metodi. Abbiamo somministrato la CAPS e sottoposto ciascun soggetto a misurazioni MRI del cervello (condotte con Optimized Voxel-Based Morphometry). I pazienti hanno ricevuto 12 sedute di EMDR nell’arco di tre mesi. Sia i pazienti che i controlli sono stati successivamente rivalutati al termine della terapia. Risultati. Alla misurazione baseline, il volume della materia grigia (GMV) differiva significativamente tra pazienti e controlli (F 1,35=3.674; p=,008; η2=0,298). Le analisi delle scansioni ottenute a 3 mesi non hanno mostrato variazioni per i controlli, mentre hanno messo in evidenza cambiamenti significativi per pazienti che sono stati sottoposti a terapia EMDR, con un aumento significativo della GMV nel giro paraippocampale sinistro, e una diminuzione significativa della GMV nella regione del talamo sinistro. A seguito del trattamento EMDR 16 pazienti su 19 non soddisfacevano più criteri per una diagnosi di PTSD, dato che si riflette in un miglioramento significativo ottenuto alle CAPS (t (35)=2.132, p<,004). Discussione e conclusioni. I risultati hanno indicato cambiamenti nella morfologia del cervello per i pazienti sottoposti a terapia EMDR. Nell’articolo verrà discusso il meccanismo di azione del trattamento EMDR, con l’obiettivo di comprendere se esso possa agire a livello del talamo, un’area implicata nel PTSD. KEY WORDS: DPTS, EMDR, morfo-volumetria. Eye Movement Desensitization and Reprocessing (EMDR) is a psychotherapy that has been found to effectively resolve the effects of traumatic experiences1 and following numerous randomized clinical trials2 in patients with post-traumatic stress disorder (PTSD) it has been recognized as a first-line treatment for PTSD3. PTSD is characterized by dysfunction and structural alteration of several discrete brain regions. Neurobiological investigations of PTSD have shown that it may be characterized by lower density in limbic and paralimbic cortices4, with changes in gray and white matter volume and concentration (GMV and GMC, respectively) in hippocampus, parahippocampal gyrus and cingulum4,5. However possibly due to the high heterogeneity of traumatic events causing PTSD and of patients symptoms (i.e. hyperarousal vs dissociation) as well as of cohort sizes a surprisingly large variance across studies has been reported. Most Magnetic Resonance Imaging (MRI) studies on PTSD have measured volumetric changes in discrete brain regions or small brain structures. Karl et al. in a meta-analysis of structural brain MRI in PTSD6 concluded that the disorder is associated with abnormalities in multiple frontal-limbic system structures, notably in hippocampi, amygdala, and anterior cingulate cortex. Similarly, a recent meta-analysis by Woon et al on 39 hippocampal volumetric studies identified significant hippocampal volume reduction in individuals with PTSD7. Furthermore, investigating the changes in GMC in patients with and without PTSD, Zhang et al.5 found those with PTSD showing significantly decreased GMC in left anterior hippocampus and left parahippocampal gyrus and Nardo et al.4 showed a lower grey matter density in limbic and paralimbic cortices to be associated with PTSD diagnosis. Studies investigating the effect of Cognitive behavioural therapy (CBT) on hippocampal volume in PTSD patients have reported conflicting results8,9. Recently functional studies have reported EMDR-related neurobiological changes10,11 and our group has investigated the structural changes after successful treatment of PTSD with EMDR showing an average increase of 6% in hippocampal volume following remission of diagnosis after three months of EMDR therapy12-14. The aim of the present study was to extend such investigation beyond the regional assessment computing in PTSD patients and healthy controls a voxel-wise analysis on the whole brain assessing the anatomical changes occurring following EMDR therapy. Thirty-eight participants were studied: 19 drug-naive patients with PTSD (10 men and 9 female) and 19 age matched healthy controls (15 men and 4 women). The patient group was recruited at the Center for the Diagnosis and Treatment of Post-Traumatic Stress Disorder, Department of Psychiatry, University of Siena, between September 2010 to May 2012 and largely overlapped the cohort recruited for a previous study14. Patient inclusion criteria were: age between 18 and 65 years and the drug-naïve status. Exclusion criteria were: a history of current and/or lifetime comorbid psychiatric diagnoses as determined by the SCID; previous or current use of any psychotropic medications; history of head trauma; presence of neurological, endocrine, or degenerative disorders. Healthy controls were recruited at the hospital “Le Scotte” in Siena, Italy, and matched for age, education, handedness, weight and height. Exclusion criteria for controls were: a history of meningitis, traumatic brain injury, presence of neurological, endocrine and degenerative disorders, use of drugs and previous or current use of any psychotropic medications, neurological or psychiatric problems, as shown by clinical history and psychiatric evaluation. All participants consented to participate after having been informed about the purpose of the research and none of them received economic compensation for participating in the study. The study was approved by the Institutional Ethical Committee of Siena University, and the study adhered to the tenets of the Declaration of Helsinki. Patients and control participants underwent a complete Psychiatric evaluation and a MRI at baseline (T1). Patients received 3 months of EMDR treatment, and then were evaluated post-treatment (T2) with MRI and CAPS. Healthy controls were re-evaluated by MRI at 3 months (T2) after baseline acquisition. A comprehensive psychiatric evaluation was conducted at baseline. Psychiatric diagnoses based on DSM-IV15 and on the Structured Clinical Interview for DSM-IV (SCID)16,17 were determined by a consensus of two psychiatrists not otherwise involved in the study. Healthy controls were assessed with the SCID - Non-Patient version18. 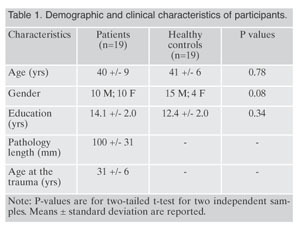 Patients were evaluated with the SCID for DSM-IV Axis I (SCID-I/P) and Axis II (SCID-II/P) disorders in order to determine a single diagnosis of PTSD, and were assessed with the Clinician Administered PTSD Scale (CAPS) Italian Version19, which is known to be a reliable measure of PTSD symptoms severity with subcomponents for the individual symptom clusters. We administered the Davidson Trauma Scale (DTS), a dimensional measure of PTSD with 17 items (with scores ranging from 0-136) for PTSD severity. An evaluation for the presence of overlapping symptoms between PTSD, Major Depressive Disorder, and state of anxiety was also performed respectively with the Hamilton Depression Rating Scale (HAM-D)20, and the Hamilton Anxiety Rating Scale (HAM-A)21. At post-treatment, the CAPS was administered to patients again. The treatment followed the guidelines by Shapiro1. In brief, as the EMDR session begins the worst image of the traumatic memory is recalled as well as negative beliefs, disturbing emotions and body location of the disturbance. Then, the patient focuses on these memories while the therapist performs for about 30s a bilateral stimulation guiding attention from right to left with sets of 30s. At the end of each set the patient reports what she noticed and the procedure is repeated until memory is reprocessed and adapted. At this stage the patient recalls the traumatic experience without disturbing emotions, improving her self-belief and being free of body tension. A successful treatment implies that the client visualizes himself in a situation where he will face the same traumatic events without emotional disturbance. EMDR desensitizes past, present and future issues related to traumatic events reprocessing them and reaching symptom remission. Patients were randomly assigned to one of three trained psychotherapists. Duration of the treatment was 3 months, with 12 90-minute EMDR sessions provided on a weekly basis. The BLS included eye movements (patient following the therapist’s finger) or tactile (therapist tapping the patient’s hand). Tactile taps were alternated to eye movements during some of the sessions only if the patient could not concentrate during eye movements or complained about not being able to follow the fingers. All sessions were videotaped; the fidelity to the treatment protocol was assessed by an independent evaluator, a psychologist and licensed psychotherapist, who was an EMDR European-approved consultant and supervisor and not involved in the present study. MRI examinations of all participants were performed at a 1.5 Tesla Philips Intera scanner (Philips Medical Systems, Best, The Netherlands). Morphovolumetric analysis were run onto T1-weighted Fast Field Echo (FFE) 1-mm thick images of the entire brain (TR/TE=30.00/4.6 ms, flip angle=30.00, FOV=250 mm, matrix 256x256, slice number=150), acquired in the axial plane parallel to the anterior and posterior commissures. Neuroradiological examination also included FFE 1-mm thick coronal images (TR=30.00/4.6 ms, flip angle=30.00, FOV=250 mm, matrix 512x512, slice number=75), T2-weighted Turbo Fluid Attenuated Inversion Recovery (FLAIR) 3-mm-thick axial images (TR/TE=9000/110ms, IR delay=2500ms, FOV=230mm, matrix 512x512, slice number=40). An optimized voxel-based morphometry (VBM) protocol was performed (i) at baseline (Time 1), to determine any abnormality of grey matter concentration (GMC) and volume (GMV) in patients compared to healthy participants, and (ii) at post-EMDR (Time 2) to evaluate longitudinal changes in regional brain volumes of patients. For image pre-processing we used the freely available SPM8 software package (Statistical Parametric Mapping software: http://www.fil.ion.ucl.ac.uk/spm/) implemented in Matlab 7.11 (MathWorks Inc., Sherborn, MA). Pre-processing included “unified” segmentation and spatial registration as implemented in the tool “new segment” followed by diffeomorphic registration 22 of the grey and white matter probability maps derived from the previous step and affine-only registration to the standardized Montreal Neurological Institute - MNI space (ICBM 152, Montreal Neurological Institute standard T1-weighted template). Hidden Markov Random Field model was applied in all segmentation processes in order to remove isolated voxels. The customized prior images and T1-weighted template were smoothed using an 8 mm Full-Width at Half-Maximum Isotropic Gaussian Kernel (FWHM IGK). Modulated gray matter images were smoothed using an 8-mm FWHM IGK for gray matter volume analysis, unmodulated gray matter images were smoothed using a 12 mm FWHM IGK for GMC analysis. Differently from cross-sectional analysis, where data images can be processed independently for each participant, for treatment effect evaluation we adopted special analysis parameters 23-25. Each participant image was registered to mean baseline image and spatial normalization process was applied only for the baseline image and then applied to all images. One-way Analysis of CoVariance (ANCOVA) models as implemented in SPM8 were applied. We compared GMV changes across groups covarying for age, gender and Total Intracranial Volume (sum of gray and white matter tissues maps, TIV). GMC group differences were assessed using age and gender as covariates. Multiple comparison corrections were performed using Montecarlo simulation (corrected p<0.05), taking into account both the individual voxel probability threshold and voxel cluster size in order to establish the probability of false-positive detection (cluster connection radius 4 mm, individual voxel threshold p=0.01, iterations=1000, FWHM=8 mm, inclusive masks obtained by averaging participants grey matter tissue maps). All results were reported using MNI coordinate system. Anatomical localization of significant clusters was performed using ANATOMY toolbox for SPM8 (http://www.fz-juelich.de/inm/inm-/DE/Forschung/docs/SPMAnatomyToolbox). We compared the T1 and T2 images of patients and controls, for both GMV and GMC applying the same statistical thresholds. All analyses were calculated using MNI coordinate system. Significant clusters anatomical mapping was performed using ANATOMY toolbox for SPM8. Patients and controls did not statistically differ for demographic data, as reported in Table 1. Patients’ diagnoses of PTSD at baseline (T1) were confirmed by clinical evaluation and by the fulfilment of all the criteria at CAPS. All patients had experienced a one-time adult trauma: natural disaster (n=3), sudden death of a family member (n=5), car accident (n=2), assault/robbery (n=6), and terrorist attack (n=4). One patient dropped out because of a depressive episode onset and consequently we removed a matched healthy control participant. The GMV comparison between patients and healthy participants at baseline showed significant differences (F 1,35=3.674; p=.008; η2=.298). Analyses revealed a region of significantly decreased GMV in patients’ left parahippocampal region, supplementary motor area, lingual gyrus, and both left and right superior frontal gyrus. Patients with PTSD also showed a significant increase in GMV corresponding to right angular gyrus, inferior parietal lobule and left inferior temporal gyrus. MNI coordinates of each significant cluster, F-values and clusters dimension are reported in Table 2. The GMC comparison between patients and healthy participants at baseline did not show any significant differences (F 1,35=0.984; p=.332). During the baseline assessment, patients showed a moderate to severe PTSD symptom severity, as highlighted by the DTS values: DTS total score was 99 +/- 9 with mean scores for each subscale of Intrusion 32 +/- 9, Avoidance 40 +/- 14 and Hypervigilance 27 +/- 9. At pre-treatment, the mean CAPS total score was 75.8 (+/- 21.8), with mean score for re-experiencing subscale of 17.0 +/- 8, avoidance 20.5 +/- 9.0; and hyperarousal 18.5 +/- 9.8. After 12 sessions of EMDR (Time 2), there was a significant pre-post decrease on the mean CAPS total score (19.3 +/- 15.5) (t (35) =2.132, p<.004) and hyperarousal subscale (4.1 +/- 9.8; p<.001) (t (35)=1.347, p<.008), and a non-significant trend to decrease on the re-experiencing (6.8 +/- 8.0) and avoidance (9.8 +/- 9.0) subscales. All 19 patients completed EMDR therapy and reported improvements in their PTSD symptoms, with 16 patients no longer satisfying necessary criteria for PTSD diagnosis. Group-time interactions for GMV maps were significant (F (1,35)=4.324; p=.006; η2=.398), indicating a larger increase in GMV in patients as compared to healthy controls, specifically for left parahippocampal gyrus (F (1, 35)=11.237; p=.001, MNI x=-24, y=-21, z=-29; voxels=246), where patients had showed a significantly smaller GMV compared to controls before the EMDR treatment (Figure 1). Additionally, in comparison to healthy controls, a cluster of decreased GMV was found in patients’ left thalamus region after EMDR treatment (F (1, 35)=9.432; p=.002, MNI x=-9, y=-24, z=6; voxels=168) (Figure 2). No differences between first and second MRI acquisition were highlighted for healthy control participants (F 1,35=01.346; p=.389). The ANCOVA comparing baseline and post-EMDR GMC and VCBT did not show any significant differences (F 1,35=0.989; p=.421). In this study brain MRI measurements with Optimized Voxel-Based Morphometry was used to investigate the neurobiological effects of EMDR treatment in drug-naïve PTSD without comorbidity. Consistent with other volumetric findings26,27, when we compared patients with PTSD to healthy controls at baseline, we found significantly smaller GMV in the patients’ parahippocampal, parietal and frontal regions, and significantly larger GMV in temporal and parietal areas (Table 2) all regions involved in processing and storing mechanism of traumatic events27. Furthermore, after treatment completion comparisons with baseline showed in patients a significant increase in GMV in left parahippocampal gyrus and a significant GMV decrease in left thalamus. The implementation of VBM has allowed to extend the structural analysis to the entire brain overcoming the limitation of our previous investigations restricting the assessment of the effect of EMDR to the hippocampal region. Structural evaluation provides understanding of a disorder’s neurobiological substrate and allows to anatomically identify and measure changes which have clinical implications. Although to date we are still far from matching symptoms and single alterations, several works investigating PTSD suggested that many symptoms and/or psychopathological characterizations appear to be closely related to some specific neurobiological alterations. In the present study hippocampus, the main site for short-term memory processing, was found at baseline significantly smaller than in healthy controls and its volume increased following successful EMDR therapy. Hippocampus is involved in encoding, consolidating and retrieving declarative memories 28,29 and receives extensive inputs from several regions of the neocortex30,31. Hippocampal dysfunction has been claimed to play a key role in the memory disturbances considered to be the core component in PTSD5-7 and it is known by long that PTSD is associated with abnormalities in activity and volume of the hippocampus32, as is it true in the symptomatic phase for our patients. It has been speculated that in PTSD emotional information is retained in amygdala and hippocampus and this pathological condition might be related to hippocampal volume reduction, possibly due to the effect of chronic release of cortisol, affecting specifically this brain region. Moreover, a failure in the functionality of this structure reduces the ability to recover from PTSD following EMDR treatment implying an impairment in extinguishing conditioned trauma responses by modifying or integrating traumatic memories 4. Our results not only replicate at whole brain level the ones reported when only hippocampi where analyzed in the same cohort of patients before and after EMDR14 but are also in accordance with other investigations in which significant hippocampal atrophy was found in patients not responding to EMDR therapy4 and hippocampal grey matter volume was reported to increase following successful psychotherapies9,33. Such increase in volume might not only be due to the decreased cortisol levels during the asymptomatic phase9, but also likely reflects an increase in synapses and dendritic connections due to a better networking after psychotherapy34. At this stage when clinical PTSD scores decrease and the symptoms of hyperarousal disappear hippocampus regain its capability to properly project to cortical regions and its activity normalizes. There is little doubt the thalamus plays an important role in the etiology of PTSD; however, the data related to thalamic alterations are difficult to understand, and the literature expresses disparate views. There are conflicting data relating to the structure and volumetry of the thalamus in relation to the clinical pattern but it is widely accepted that this brain structure is implicated in the pathology of PTSD. Thalamus is deactivated in patients with PTSD 35 and the alterations in thalamo-cortical connectivity may be implicated in excessive fear recall, failure of expression and maintenance of extinction memory, and heightened traumatic remembrance36. We observed a cluster of decreased GMV in patients’ left thalamus region after EMDR treatment. Decreases in thalamic volume27 thalamic hyperactivation and hyperfunction37 were correlated with PTSD re-experiencing symptoms37. Thalamus was also shown by fMRI to be hyperactivated in stress-induced analgesia38, non-conscious fear39 and alexithymia40. A possible explanation for our findings is that post-EMDR decrease in re-experiencing symptoms, also if a large but not significant trend, has resettled the normal functioning of the thalamus and somehow diminishes its hyperactivation resulting in parallel changes at a structural level. On the other hand it has been reported that emotional processing is linked to anterior and posterior cingulate cortex co-activation mediated by the thalamus. The clinical efficacy of EMDR reducing the emotional valence of the event might have also contributed to a decrease of thalamic involvement in trauma re-living and hence to a volume decrease as compared to the symptomatic phase. The structural changes found after EMDR therapy as compared to the symptomatic phase paralled the significant decrease in clinical (CAPS) ones, mainly due to the hyperarousal sub-scale but also determined by the sub-threshold decreases in the re-experiencing and avoidance sub-scales. The latter results showing a mere trend to significant changes could be due to the small sample size increasing the likelihood not only of type I (false positive) but also type II (false negative) errors. EMDR is widely recognized as an efficacious treatment for PTSD 3 rapidly effective, significantly reducing PTSD symptoms, and resulting in a high rate of elimination of the diagnosis of PTSD. Beside, its neurobiological correlates have been recently investigated and reported4,12-14,41. According to our results the clinical effectiveness of EMDR may lay in the restoration of hippocampus structure. 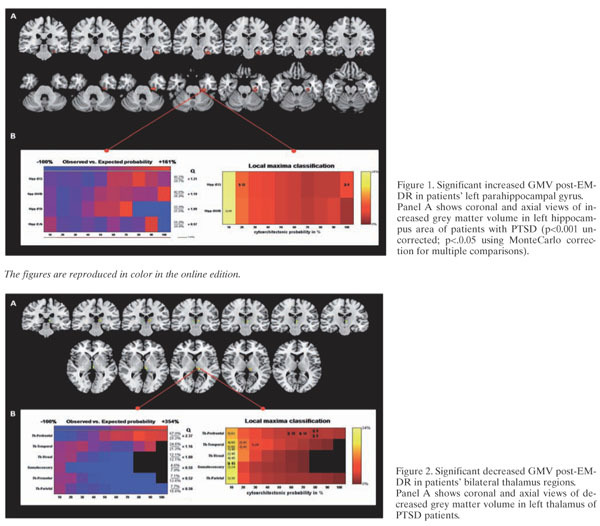 Following EMDR treatment, we observed in this region an increase in GMV speaking in favour of a parallel recovering in hippocampal functions and cortical networking, with successful processing of the traumatic memory and resolution of current triggers. Also if its mechanism of action is beyond the purposes of this paper our results suggest that the EMDR leads to a better hippocampal functioning favoring neuronal integration between subcortical areas and cerebral cortex. This is in agreement with previous investigations in which the memory retention of the traumatic event was shown to move from emotional limbic subcortical regions including parahippocampal gyrus to an explicit cortical ones and elaborated at higher cognitive level 10,42. On the other hand working memory processed by hippocampus has been hypothesized to be a determinant of EMDR effectiveness. The reduced vividness of emotional memory during bilateral stimulation might be due to limited working memory resources and this would be in accordance with the reduced hippocampal volume found in PTSD patients at baseline. In this respect we provided preliminary evidence that effective treatment may be reflected in anatomical and functional changes in some critical areas altered by PTSD and this has in perspective a great utility, producing more objective measurement than the self-report measures typically used in treatment outcome studies. Such insights could be used to select treatments which could target specific neurobiological alterations, with the goal of achieving resolution of biological damage and, subsequently, the disorder. One limitations of this study is the small sample size possibly overestimating the number of foci showing significant differences43. On the other hand the relative high costs of the methodology, makes the recruitment of an inadeguate number of subjects to be investigated a common limitation in neuroimaging studies. For this reason in our study as in other ones in the past patients recruitment and characterization suffer of the presence of different trauma types and of discrepancies about the number of previous traumas, both issues potentially biasing the results. We also acknowledge that the recruitment of PTSD patients without comorbidity and of non-traumatized control subjects might render the results of the present investigation not directly comparable to other studies in the same field. However, the with-in subject analysis strengthened, along with the objective decrease of PTSD clinical scores, the reliability of the pre- to post-therapy changes and in the most of the control subjects mix lifetime traumas, even if not causing symptoms have certainly happened 10. Furthermore, the absence of follow-up to evaluate the maintenance of symptomatic improvement and the volumetric changes does not allow to draw conclusion on the long-term effectiveness of EMDR therapy. Future research might benefit of optimized voxel based morphometry and by the use of diffusion weighted images acquisition aimed at white matter fiber tracts changes detection, to examine the possible impact of psychotherapies on brain structural connectivity. Acknowledgements: Louise Maxfield, Ph.D. professionally edited this paper. She is a Psychologist in London Ontario Canada, affiliated with London Health Sciences Centre, the Departments of Psychiatry and Psychology at University of Western Ontario, and the Department of Psychology, Lakehead University, Canada. She is editor in chief of the Journal of EMDR Practice and Research. Contact information: email: maxfield@rogers.com; mail: 523 Upper Spring St. Port Stanley ON, Canada, N5L1G7. She has no conflict of interest. Conflicts of interest: the authors declare that no source of funding was received to prepare this article. 1. Shapiro F. Eye Movement Desensitization and Reprocessing: Basic principles, protocols, and procedures. New York: Guilford Press, 1995. 2. Bisson J, Andrew M. Psychological treatment of post-traumatic stress disorder (PTSD). Cochrane Database of Systematic Reviews 2007; 3. 3. National Institute for Clinical Excellence (NICE). Post-traumatic stress disorder (PTSD). The management of PTSD in adults and children in primary and secondary care. Clinical Guideline 26. 2005. 4. Nardo D, Högberg G, Looi JCL, Larsson S, Hällström T, Pagani M. Gray matter density in limbic and paralimbic cortices is associated with trauma load and EMDR outcome in PTSD patients. J Psychiatr Res 2010; 44: 477-85. 5. Zhang J, Tan Q, Yin H, et al. Decreased gray matter volume in the left hippocampus and bilateral calcarine cortex in coalmine flood disaster survivors with recent onset PTSD. Psychiatry Research: Neuroimaging 2011; 192: 84-90. 6. Karl A, Schaefer M, Malta LS, Dörfel D, Rohleder N, Werner A. A meta-analysis of structural brain abnormalities in PTSD. Neurosci Biobehav Rev 2006; 30: 1004-31. 7. Woon FL, Sood S, Hedges DW. Hippocampal volume deficits associated with exposure to psychological trauma and posttraumatic stress disorder in adults: a meta-analysis. Prog Neuropsychopharmacol Biol Psychiatry 2010; 34: 1181-8. 8. Lindauer RJ, Booij J, Habraken JB, et al. Effects of psychotherapy on regional cerebral blood flow during trauma imagery in patients with post-traumatic stress disorder: a randomized clinical trial. Psychol Med 2008; 38: 543-54. 9. Levy-Gigi E, Szabo C, Kelemen O, Keri S. Association among clinical response, hippocampal volume, and FKBP5 gene expression in individuals with posttraumatic stress disorder receiving cognitive behavioral therapy. Biol Psychiatry 2013; 74: 793-800. 10. Pagani M, Di Lorenzo G, Verardo AR, et al. Neurobiological correlates of EMDR monitoring: an EEG study. PLoS ONE 2012; 7: e45753. 11. Pagani M, Di Lorenzo G, Verardo AR, et al. Substrato neurobiologico della terapia con EMDR. (Neurobiological correlates of EMDR therapy.) Riv Psichiatr 2012; 47: 16-8. 12. Bossini L, Casolaro I, Santarnecchi E, et al. Studio di valutazione dell’efficacia clinica e neurobiologica dell’EMDR in pazienti affetti da disturbo da stress post-traumatic. [Evaluation study of clinical and neurobiological efficacy of EMDR in patients suffering from Post-Traumatic Stress Disorder]. Riv Psichiatr 2012; 47: 12-5. 13. Bossini L, Fagiolini A, Castrogiovanni P. Neuroanatomical changes after eye movement desensitization and reprocessing (EMDR) treatment in posttraumatic stress disorder. J Neuropsychiatry Clin Neurosci 2007; 19: 475-6. 14. Bossini L, Tavanti M, Calossi S, et al. EMDR treatment for posttraumatic stress disorder, with focus on hippocampal volumes: a pilot study. J Neuropsychiatry Clin Neurosci 2011; 23: E1-2. 15. American Psychiatric Association. Diagnostic and Statistical Manual of Mental Disorders. 4th ed., text rev. American Psychiatric Publishing, 2000. 16. First MB, Spitzer RL, Gibbon M, Williams JB. Structured clinical interview for Axis I DSM-IV disorders-patient Edition (SCID-I/P, version 2.0). New York: Biometrics Research Department, New York State Psychiatric Institute, 1996. 17. First MB, Spitzer RL, Gibbon M, Williams JB. Structured clinical interview for axis II DSM-IV disorders (SCID-II/P). New York: Biometrics Research Department, New York State Psychiatric Institute, 1994. 18. First MB, Spitzer RL, Gibbon M, Williams JB. Structured clinical interview for Axis I DSM-IV disorders, Non-patient edition (SCID-I/NP, version 2.0). New York, Biometrics Research Department, New York State Psychiatric Institute, 1995. 19. Blake DD, Weathers FW, Nagy LM, et al. The development of a Clinician-Administered PTSD Scale. J Trauma Stress 1995; 8: 75-90. 20. Hamilton M. A rating scale for depression. J Neurol Neurosurg Psychiatry 1960; 23: 56-61. 21. Hamilton M. The assessment of anxiety states by rating. Br J Med Psychol 1959; 32: 50-5. 22. Ashburner J. A fast diffeomorphic image registration algorithm. Neuroimage 2007; 38: 95-113. 23. Hayasaka S, Phan K, Liberzon I, Worsley KJ, Nichols TE. Nonstationary cluster-size inference with random field and permutation methods. Neuroimage 2004; 22: 676-87. 24. Draganski B, Gaser C, Busch V, Schuierer G, Bogdahn U, May A. Neuroplasticity: changes in grey matter induced by training. Nature 2004; 22: 311-2. 25. Draganski B, Gaser C, Kempermann G, et al. Temporal and spatial dynamics of brain structure changes during extensive learning. J Neurosci 2006; 26: 6314-7. 26. Chen Y, Fu K, Feng C, et al. Different regional gray matter loss in recent onset PTSD and non PTSD after a single prolonged trauma exposure. PLoS One 2012; 7(11). 27. Shucard JL, Cox J, Shucard DW, et al. Symptoms of posttraumatic stress disorder and exposure to traumatic stressors are related to brain structural volumes and behavioral measures of affective stimulus processing in police officers. Psychiatry Research 2012; 204: 25-31. 28. Squire LR, Zola-Morgan S. The medial temporal lobe memory system. Science 1991; 253: 1380-6. 29. van Strien NM, Cappaert NL, Witter MP. The anatomy of memory: an interactive overview of the parahippocampal-hippocampal network. Nat Rev Neurosci 2009; 10: 272-82. 30. Lavenex P, Amaral DG. Hippocampal-neocortical interaction: a hierarchy of associativity. Hippocampus 2000; 10: 420-30. 31. Furtak SC, Wei SM, Agster KL, Burwell RD. Functional neuroanatomy of the parahippocampal region in the rat: the perirhinal and postrhinal cortices. Hippocampus 2007; 17: 709-22. 32. Gilbertson MW, Shenton ME, Ciszewski A, et al. Smaller hippocampal volume predicts pathological vulnerability to psychological trauma. Nat Neurosci 2002; 5: 1242-7. 33. Hölzel BK, Carmody J, Vangel M, et al. Mindfulness practice leads to increases in regional brain gray matter density. Psychiatry Res 2011; 191: 36-43. 34. Kircher TV, Arolt A, Jansen M, et al. Effect of cognitive behavioral therapy on neural correlates of fear conditioning in panic disorder. Biol Psychiatry 2013; 73: 93-101. 35. Lanius RA, Williamson PC, Densmore M, et al. The nature of traumatic memories: a 4-T FMRI functional connectivity analysis. Am J Psychiatry 2004; 161: 36-44. 36. Yin Y, Jin C, Hu X, et al. Altered resting-state functional connectivity of thalamus in earthquake-induced posttraumatic stress disorder: a functional magnetic resonance imaging study. Brain Res 2011; 1411: 98-107. 37. Kim SJ, Lyoo IK, Lee YS, et al. Decreased cerebral blood flow of thalamus in PTSD patients as a strategy to reduce re-experience symptoms. Acta Psychiatr Scand 2007; 116: 145-53. 38. Lanius RA, Bluhm RL, Frewen PA. How understanding the neurobiology of complex posttraumatic stress disorder can inform clinical practice: a social cognitive and affective neuroscience approach. Acta Psychiatr Scand 2011; 124: 331-48. 39. Felmingham K, Kemp A, Williams L, et al. Changes in anterior cingulate and amygdala after cognitive behavior therapy of posttraumatic stress disorder. Psychol Sci 2007; 18: 127-9. 40. Frewen PA, Lanius RA. Toward a psychobiology of posttraumatic self-dysregulation: Reexperiencing, hyperarousal, dissociation, and emotional numbing. Ann N Y Acad Sci 2006; 1071: 110-24. 41. Lansing K, Amen DG, Hanks C, Rudy L. High-resolution brain SPECT imaging and eye movement desensitization and reprocessing in police officers with PTSD. J Neuropsychiatry Clin Neurosci 2005; 17: 526-32. 42. Pagani M, Di Lorenzo G, Monaco L, et al. Neurobiological response to EMDR therapy in clients with different psychological traumas. Front Psychol 2015; 27. 43. Fusar-Poli P, Radua J, Frascarelli M, et al. Evidence of Reporting Biases in Voxel-Based Morphometry (VBM) studies of psychiatric and neurological disorders. Hum Brain Mapp 2014; 35: 3052-65.